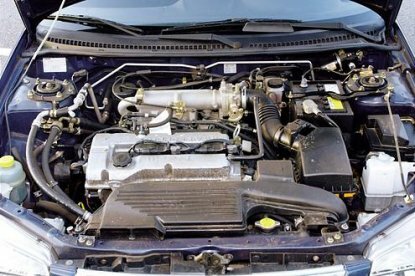 The intake manifold found on the stock 2.0l and 1.8l CA spec Protegé's have the VTCS component designed to control cold start emissions to help achieve the ULEV Emissions standard (Also other European emission standards). 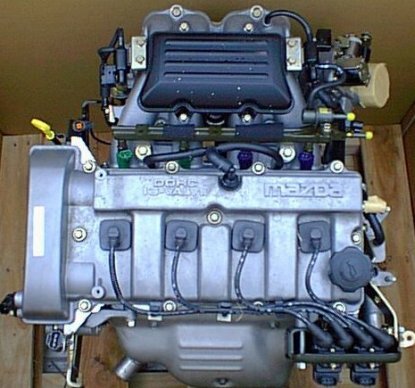 This same system also causes some minor restrictions and air turbulence in the intake manifold runners. By setting the precise length of the inlet pipe to ensure an even blend of fuel vapour with air and optimising air pressure, maximum energy and perfect burn is delivered. To boost torque at higher speeds. Conceptually, it is like a variable valve timing system (but is not the same thing) in that it allows more air to be drawn in at speeds above 4750 rpm, thereby keeping the torque curve at a higher level rather than falling off. 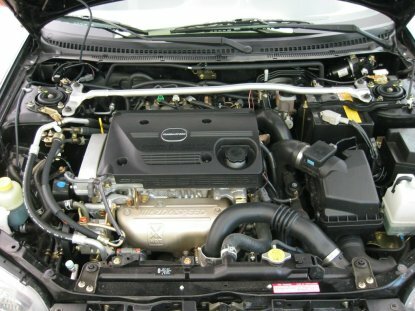 The EuroSpec ZM engine has VICS* (That's why the intake manifold looks different from the US ZM-DE). 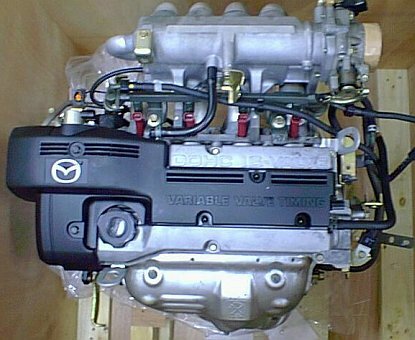 Special Note: Juan from www.HiBoost.com has developed a really nice kit for the 1.6 ZM engines ..
Top Boost: 290 WHP @ 22 psi (1,5 bar). 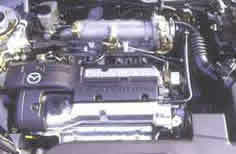 Special comments: look at the ZM engine model above. 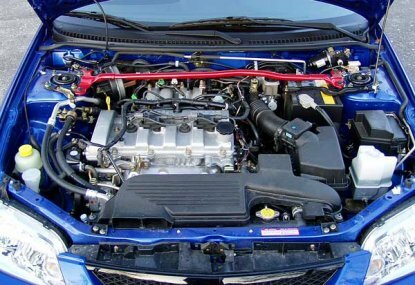 S-VT (sequential valve timing) controls the valve timing in various driving modes, through continually varying the opening and closing timing of the intake valve, to give the most suitable operation. 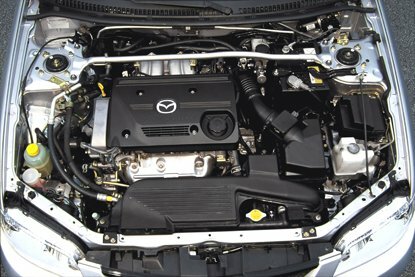 It goes without saying that the application of this control technology has simultaneously improved both the performance of the engine and its fuel efficiency, and Mazda has built this brand new mechanism into its small mass-sales car, the Familia, as its main engine (the 1.5L ZL-VE type introduced in 1998). CO2 emissions have been reduced by 16% and NOx by 14% over previous models, while the pleasure of driving the car has increased. 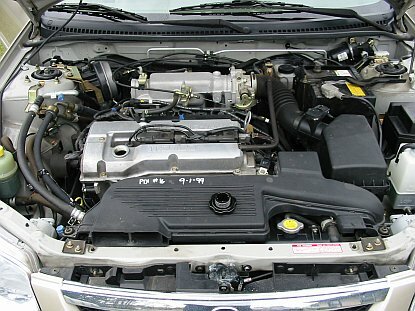 S-VT is composed of a vane actuator, which continually varies the phase of the intake valve timing and the crank angle through oil pressure, along with a computer, which calculates the intake valve timing, and an oil control valve (OCV), which controls the oil pressure in accordance with instructions from the computer. 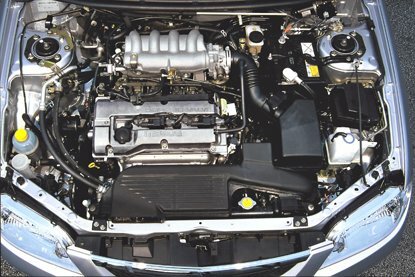 The most appropriate valve timing control can be achieved through detection of the engine's revolutions, intake volume and water temperature. NOx emissions are also reduced, through the implementation of EGR. Garrett is the largest manufacturer of turbochargers in the world, providing engine boosting systems that save fuel and reduce emissions while providing an increase to engine performance. 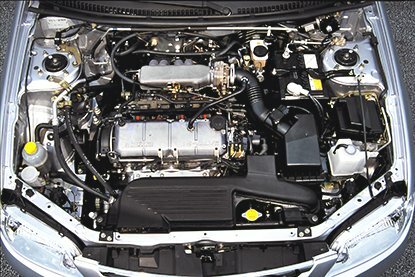 Garrett's turbocharging business has sustained its reputation for innovating turbocharger technologies generation after generation. From its long list of industry firsts to its leading-edge ball bearing turbos for racecars, Garrett develops and manufactures the same cutting-edge boosting expertise that goes into all Garrett products. The ball bearing turbos have less rotating friction than traditional journal bearing turbos. This increases turbine efficiency which allows the turbo to ‘come up on boost’ earlier and more predictably. This translates into enhanced throttle response (crisper). The T25R turbo's ball bearing cartridge is much stronger and more durable than an ordinary journal bearing turbo. 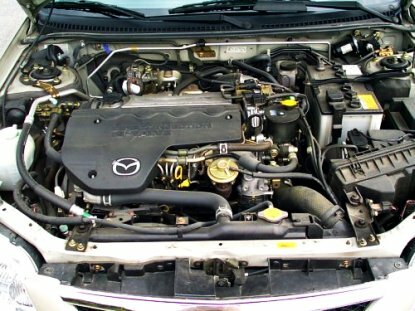 As long as the driver maintains his Protegé by changing his engine oil at regular intervals, the turbo will likely outlast the life of the engine. The T25R has a high temp compressor wheel and a turbine housing cast out of an innovative high temp material (Ductile Ni-Resist) to further improve the durability of the turbo. The end result is that the turbine housing will be nearly impervious to warpage and cracking. The water cooling lines that run to the turbo allow the unit to resist the traditional 'coking' of oil during hot engine shut-downs. 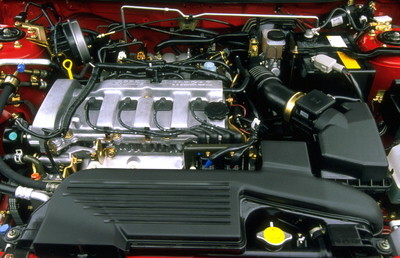 When the engine is shut down and the turbo is still very hot, a thermal syphon is created in the turbo water jacket. This has the effect of thermally pumping water through the turbo to keep it cool. مطالب این بخش از سایت http://www.protege323.com استخراج شده است.